Fitting a microchip – microchip information for the travelling cat. A microchip implant is an identifying integrated circuit placed under the skin of a pet. The chip, about the size of a large grain of rice, uses passive Radio Frequency Identification technology, and is also known as a PIT tag (for Passive Integrated Transponder)! Right now that we have that sorted!! 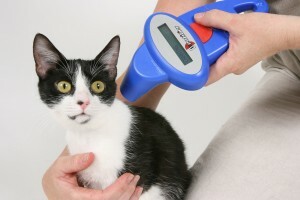 Your cat must be fitted with a microchip to identify it. You can get your pet fitted with a microchip at any time but it must be done before it is vaccinated against rabies (if applicable). Your vet should read the microchip number in your pet and record it on your pet’s vaccination record at the time of vaccination. Make sure that the microchip number is also correctly recorded on the EU pet passport or third country official veterinary certificate at the time of issue. The microchip should be inserted according to the manufacturer’s instructions (and any national rules that may apply). To ensure that the microchip works, its number should be read both before and after it has been fitted. You should also get your vet to read the microchip every time you visit and before you travel. The UK do not specify a particular type or brand of microchip to be used but, in Europe, ISO (International Standards Organisation) Standard microchips meeting specifications 11784 or Annex A of ISO Standard 11785 are generally used. If you do not, your cat may be refused entry. It can be licensed into quarantine and released early once it has met all of the requirements of the Pet Travel Scheme. 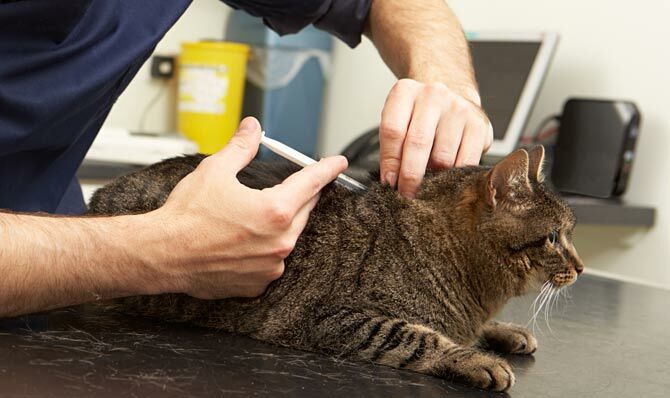 If an appropriate scanner does not read your animal’s microchip at the first attempt, further attempts should be made moving the scanner slowly and thoroughly over the animal. A more powerful scanner should be tried if available. Inserting a microchip is painless for the cat and over in seconds. If your cat’s microchip number is registered on a database, consider updating its record with your holiday details before you travel. This could help reunite you with your pet should they go missing while on holiday. Virbac have identified a functionality issue with some microchips supplied before April 2012. Virbac has contacted all of its veterinary surgeon customers with a list of their clients who have received these microchips. It has also written to all of the pet owners that may be affected, advising them to get their pets’ chips checked. If you have not received a letter but think your pet may be affected, speak to your vet. In the event your vet is unable to scan and read the original microchip, the pet must be re-chipped. If the pet has been previously prepared for travel, then it must be re-prepared in accordance with pet travel rules and a new pet passport issued. Your vet should note in ‘Section XI. OTHERS’ of the new EU pet passport that there is another microchip present that cannot be scanned and read, in case the fault is intermittent and the chip is picked up at the port when the pet is checked for compliance for entry to the UK. 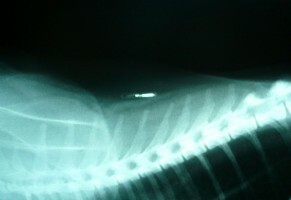 The original microchip, implanted prior to the initial rabies vaccination, must be scanned and a reading made. Having gained a reading, a new microchip may then be inserted. This statement does not need to be exactly as shown, but the dates of chip readings and the numbers of the chips must be stated and this statement should be signed and stamped by the OV. Provided this procedure is carried out as stated above, the pet will remain fully compliant with UK entry requirements under EU pet movement rules. Alternatively, pet owners may choose to fully re-prepare their animal in line with the failed microchip procedures outlined above, and have a new pet passport issued. Please consult Defra or your vets for any further information. Defra post regular updates regarding pet travel so please always check before you travel.